CrazyBob's Cops And Robbers - View topic - Marcus_Reed,Cristiedge. 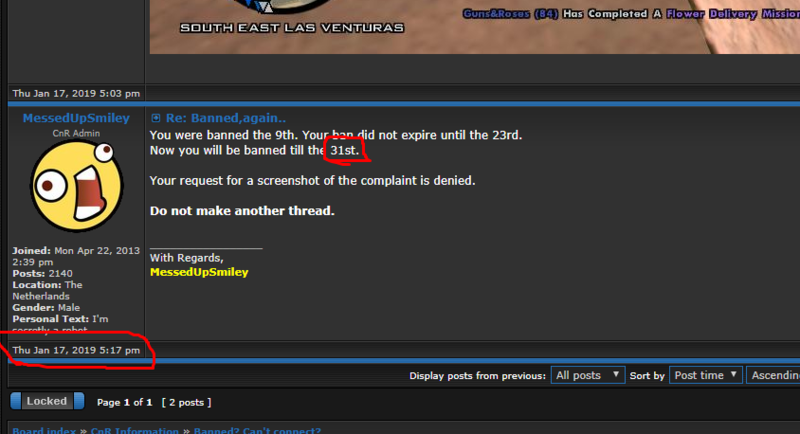 Marcus,MessedUpSmiley said my ban expires 31st. Cristiedge, im sorry what? evaded the ban like 10 times,how i don't know anything about this? You dont have any proof that i have cheated this day (31.01.2019),you dont have the right to disable me. Last edited by MaTkO.CNR on Thu Jan 31, 2019 2:46 pm, edited 1 time in total. Really like why do i get disabled? i didn't cheated..
Gele took the risk of playing on a cheater's pc and therefore, compromising his own account. Both of you can play when you disables expire ONLY IF YOU DONT EVADE IN THE MEANWHILE. Okay i am not running from the truth,i was playing on Mirinda,scg,and on the account senestro like 2 years ago. but GELE_ didn't do anything wrong this time,he doesn't deserve a disable. note. I AM NOT MANDZA,OR [[CRAZYROBBER]] !!!! You played on mirinda and scg a couple of days ago. Everyone that is linked to your connection is going down with you, I'm not willing to take any risks in allowing you to be on the server when you're not supposed to be. Your "friends" should have never played from a cheater's PC. Also, Gele would have gotten banned anyways for a complaint on him for pausing to avoid. So, you guys are allowed to play on the 14th of february, if I (or any other admins) see any of you before this date, you both go down.